Every first Saturday of the year, for 7 years now, my buddies Jim, RAM & Matt all meet up for dinner and a night out on the town. Until last year we had always gone to Baltimore to visit Matt. On that trip we had Burgers and Beers at the Belgian themed Abey Burger Bistro. Last year, Matt picked up Jim & RAM in Philly and brought them to visit me in NYC. 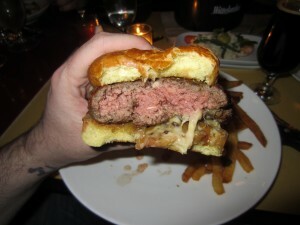 We crushed Burgers & Sausages at DBGB that night. 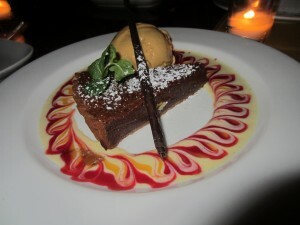 As we started to plan the 2012 reunion, the guys wanted to come back to NYC and therefore dinner plans were on my back. We’re all a bunch of serious eaters, especially Jim, who hosts a gourmet food club, so I knew I had to nail this one. Alsace is a region of France that borders on both Germany and Switzerland. It’s a center for European politics and International organizations. It has a long history of being part of the Roman Empire, fought over by the Spaniards and was for a time conquered by Germany. All of these cultures, especially German had influence on the culture and cuisine of this famous wine region, all of which are the inspiration for the Tour De France Restaurant Group’s Cafe D’Alsace. Their Chef, Philippe Roussel, has created a vast modern interpretation of the region’s cuisine, most known for Sauerkraut, Sausages,Pork and Potato dishes. Not only does the restaurant have an intense and unique Food menu but it’s matched by an equally diverse and lengthy bottle list of Wines and Beers. The entire menu can be professionally paired with drinks by their in house sommelier, Gianni Cavicchi. Don’t hesitate to ask for suggestions on pairings, you won’t be lead astray. It’s perfect for serious eaters, Wine geeks and Beer nerds. 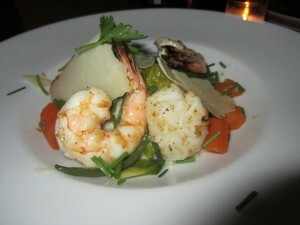 All of it comes together with a touch of class, presentation from a true appreciation for a finer dining experience. Thanks to my attendance at the Tour De France Sausage & Beer Festival, I knew Cafe D’Alsace was going to be a winner. 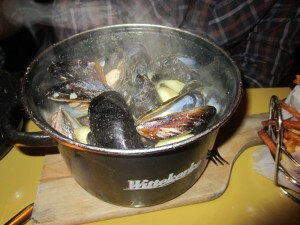 Before they even got into town everyone was emailing me with what they wanted to order off the menu! 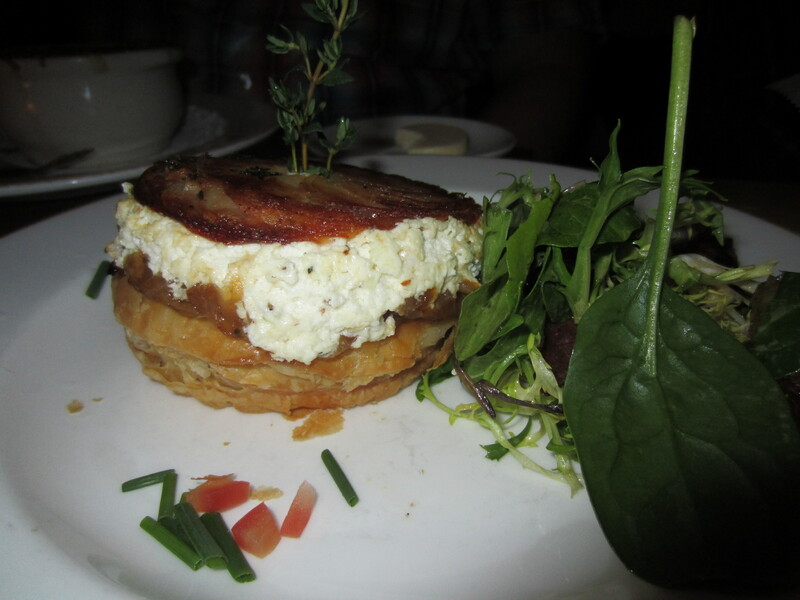 Now I know this is a Burger blog but this meal was so freakin’ epic that I want to briefly roll through it dish by decadent dish. 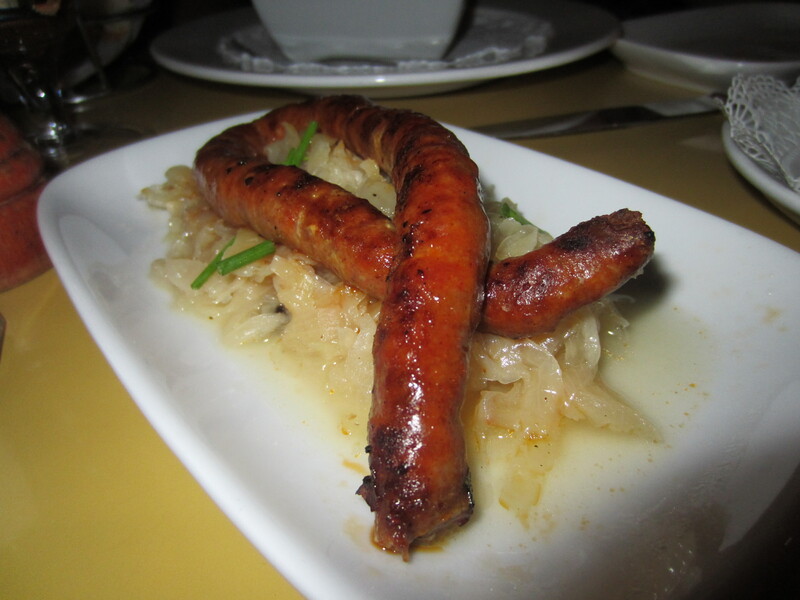 Merguez Sausage with Sauerkraut d’Alsace & assorted Mustard’s – Fully flavored and a little spicy. One of the best I’ve ever had. 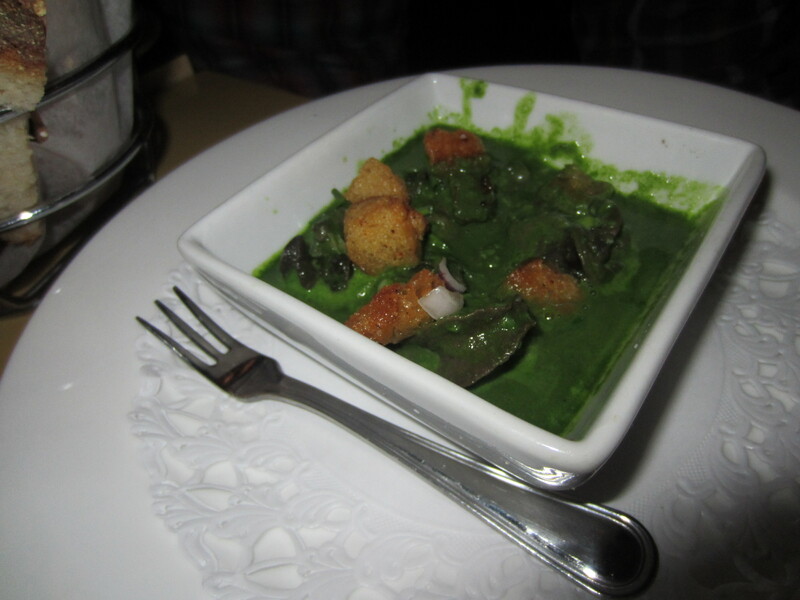 Cassolette d’Escargot sauteed with Garlic, Parsley & Butter – I won’t eat Snails but I did try the sauce and it was fantastic, almost Pesto-like. 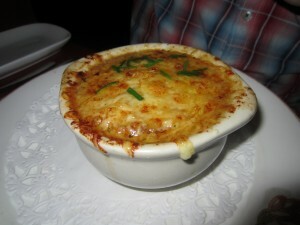 French Onion Soup – Perfectly made, very savory. Crispy Gruyere Cheese Gougeres, Creamy Gruyere in a flaky pastry made with Onions and Potatoes – It was as good as it sounds. 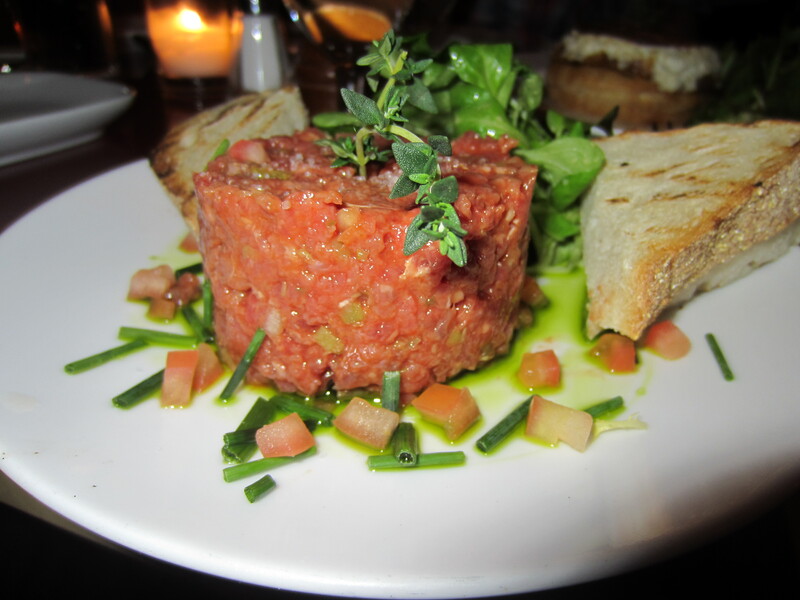 Classic Steak Tartare, Chopped Sirloin with Capers, Shallots & Dijon Mustard – Considering all the ingredients of this dish are very flavorful, this was light and more about the subtleties in the tastes. It was supreme. 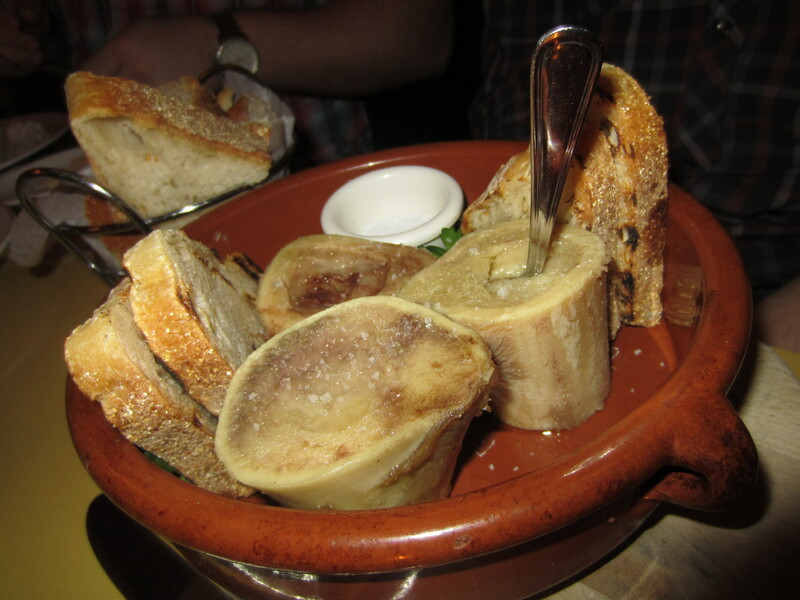 La Moelle, Bone Marrow with Fleur De Sel & Country Toast – If there was even a speck of Marrow left on these bones once we were done, I’d be surprised. We practically sucked them dry! 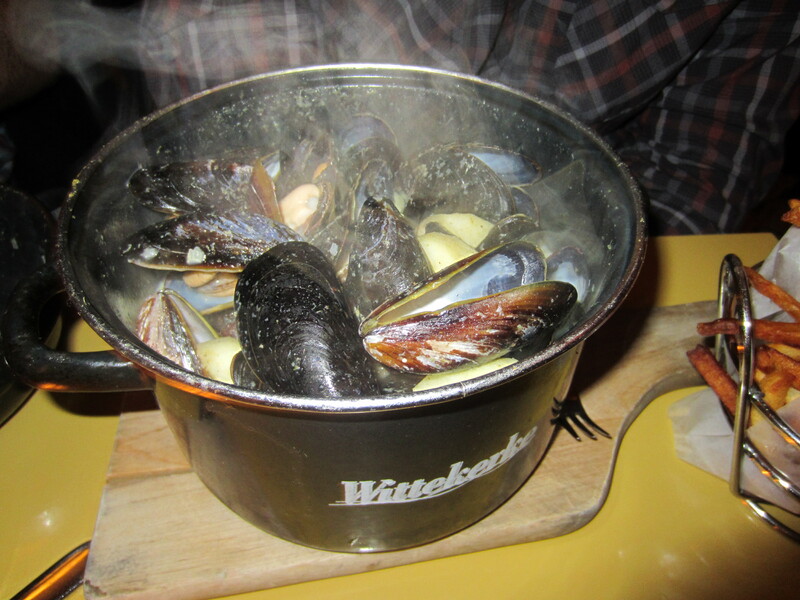 Moules Frites, Alsatian Beer braised, fresh Basil Pesto & Fries, Apple Curry, White Wine, Apple, Spicy Curry & Fries – Again, not something I would eat but Jim told the waitress they were the best he’s ever had! 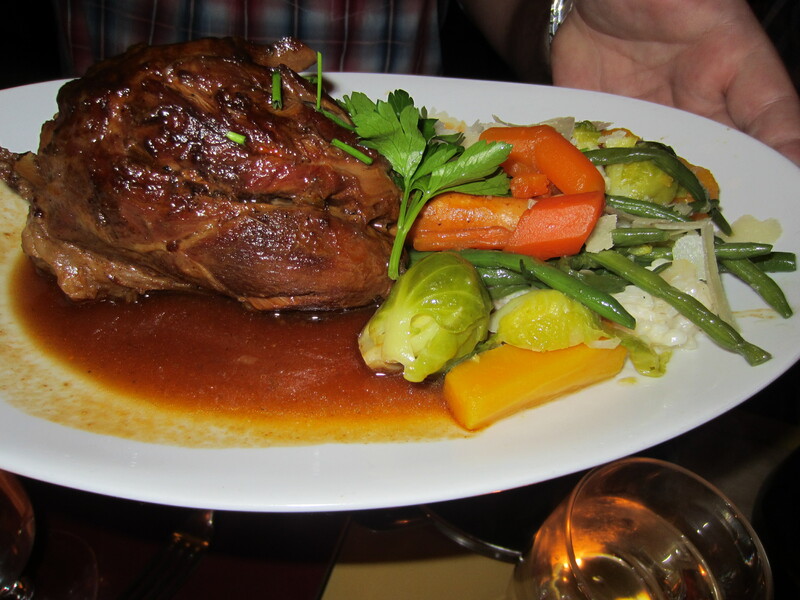 Braised Lamb Shank, wild Mushroom Risotto, Root Vegetables & Lamb Jus – Matt’s eyes almost popped out of his skull when this arrived at the table. It was absolutely juicy & succulent and much like the Bone Marrow, not a single bite left on the bone when he was done. Seafood Risotto – RAM devoured this in about 90 seconds! Chocolate Tart, Fleur De Sel, Creme Anglaise & homemade Caramel Ice Cream – I’ve been quoted as saying “why save room for Dessert when there’s still Meat to be eaten.” That being said, this was AMAZING! A perfect mix of salty and sweet, hot and cold. I seriously recommend it. Creme Brulee, traditional Custard with Tahitian Vanilla Beans – Perfectly done with a crispy coating and very creamy filling. 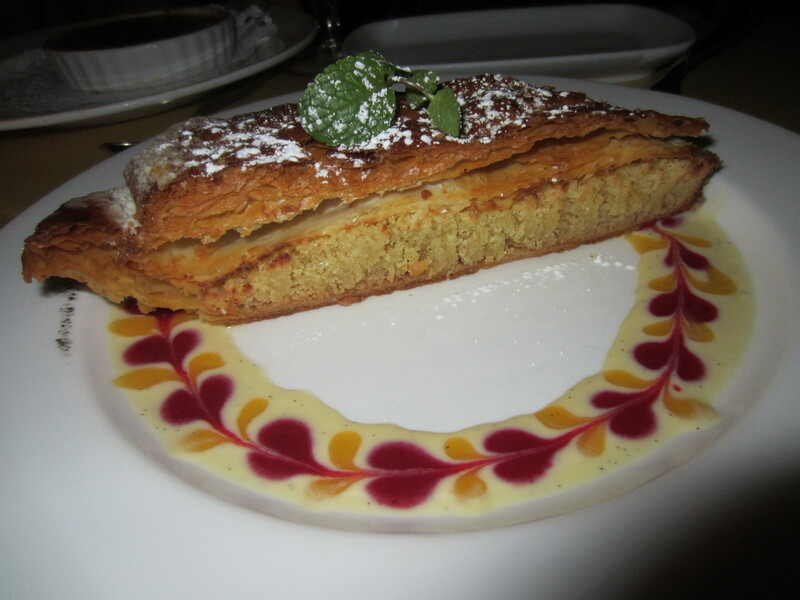 La Galette Des Rois AKA French King Cake – A light Puff Pastry Cake only served in January, usually with a toy or trinket inside of it. Whomever gets the slice with the goodie gets to be the King. 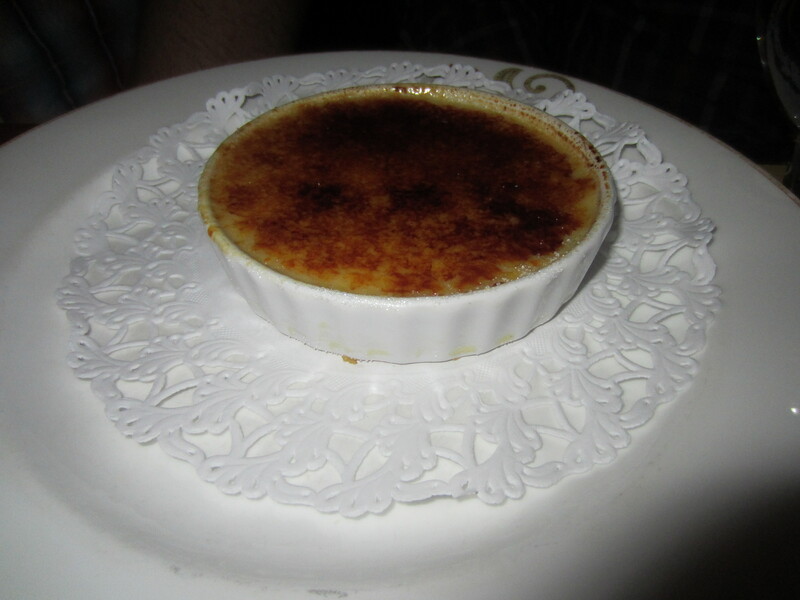 Cafe D’Alsace doesn’t add that to the mix for safety and health code reasons, but they definitely tell you the story. If this is the Cake that Kings eat, I could be happy being a King! You know a restaurant is serious about their Burgers when they have a separate section of the menu reserved for them. Cafe D’Alsace offers a Lamb, Grilled Duck, Free Range Chicken, Veggie and the star of tonight’s show, the Burger D’Alsace. It’s a 10 Ounces Patty made of freshly ground Sirloin with Caramelized Onions & choice of Gruyere, Cheddar or Alsatian Munster Cheese. (I went with the latter.) It’s all action packed on a a sweet and sturdy Brioche Bun that has the difficult task of supporting this hearty Sandwich. The Patty was perfectly cooked, bursting with an intense Beef flavor that has a slight hint of sweetness mixed throughout it’s otherwise salty profile. It’s light to the bite due to it’s loosely packed preparation that you can tell was done with care and as minimal handling as possible. The expertly Caramelized Onions when mixed with the tangy Alsatian Muenster form what I would almost liken to a French Onion Soup. SacreMoo!!! 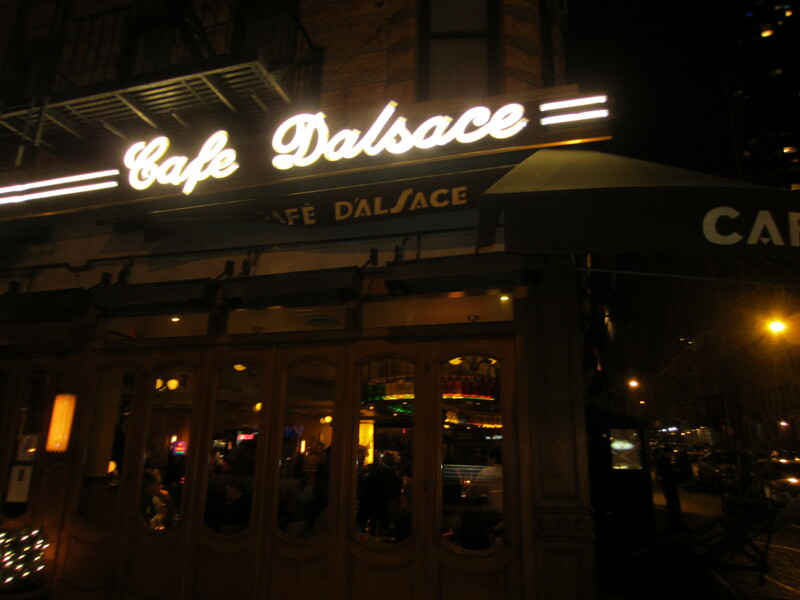 Cafe D’Alsace’ Burger D’Alsace is robust, juicy, intensely delicious and by far, one of the best Burgers in New York City! With that, CONGRATS Cafe D’Alsace, welcome to the Burger Conquest TOP BURGERS IN NYC list! But to be honest, not only is this one of the best Burgers I’ve ever had here, it’s one of the best restaurants. I actually ate here the night prior to this and had a 4 course Venison meal that absolutely blew my mind. Follow my Best Burgers in NYC list on Foursquare & Foodspotting. Cafe D’Alsace scores a 6 on The Rev Meter. 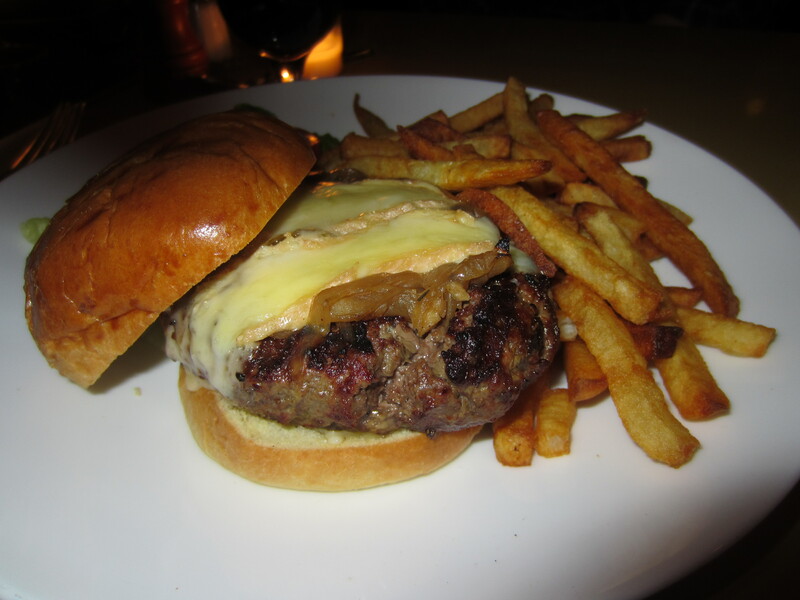 This entry was posted in Bar, Beer, Best Burger in New York, Burgers, Gourmet Burgers, Hamburgers, New York and tagged alsation, best burger nyc, burger, cafe d'alsace, cheese, ciancio, conquest, craft beer, french, fries, gianni, great, hamburger, new york, ny, nyc, Philippe Roussel, rev, review, sommelier, the, the rev meter for social community, wine list. Bookmark the permalink.